We have another group of pigeons of Annick Goeteyn about to be sold in auction. 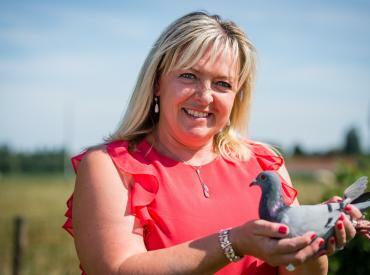 This time the 'grand dame' of pigeon racing picked a small group of pigeons, bred from the three leading breeding pairs of her team today. They are descendants of the old basis Tsaby 1 x Kim 1 and Orlando x Nicofelia. These pigeons have in turn paved the way for a long series of terrific results almost on a weekly basis. This is fantastic auction from a world class team from Belgium.